Join our Easter Egg Hunt on Sunday, March 25. Bring the whole bunch and celebrate with us! 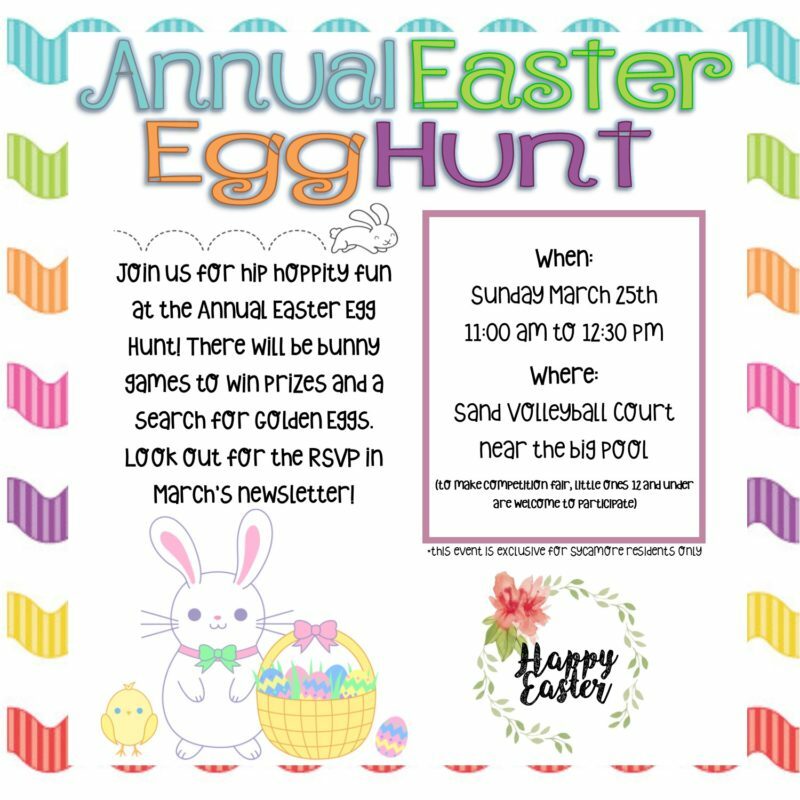 Come and join us for another fun and exciting Easter Egg Hunt at Sycamore Terrace Apartments in Temecula. It will be held at the Sand Volleyball Court on Sunday, March 25, from 11 am to 12:30 pm. Bring the whole bunch with you and enjoy our annual fun-filled celebration with other residents! We know that kids have been waiting all year for this moment – to snack on their favorite Easter chocolate. That is why we make it a point to make each celebration as unique and memorable as possible. A lot of fun activities are in store for you and your family this Easter celebration. Aside from the search for golden eggs, we have also prepared bunny games for everyone. There will be spoon-egg races, bunny hop races, egg toss, and other delightful relay activities that you can enjoy with the whole family. Children who are 12 years and under are most welcome to join the hunt. All kids will have equal opportunities during the game. They will be divided based on their age groups to ensure that the whole day will be an enjoyable experience for everyone. Our management will strictly implement game rules, so parents do not need to worry about their children. It’s time to unleash the youth in you! Make sure to bring your family and friends for a more fun-filled celebration. We at Sycamore Terrace Apartments in Temecula strive hard to build the community and make everyone engaged in the process of creating a positive and harmonious relationship among residents. We consistently seek opportunities to help make residents feel welcomed and valued by holding events and parties in the common areas. Over the years, we have been faithful to our tradition of celebrating the Easter holiday. As our loyal residents, we want you to be a part of our annual celebration. So, do not miss the chance to meet and get along with other residents. The Easter Egg Hunt is an event to strengthen the bond between you and your family. Get a chance to mingle with your neighbors while enjoying the amenities of our apartments in Temecula. You are also invited to drop by our office at any time. Sycamore Terrace is nestled in the heart of Temecula, CA. We offer a variety of newly remodeled and fully equipped apartment homes that families of all sizes can enjoy. We pride ourselves in providing some of the largest floor plans in Temecula at affordable prices. Come and discover the best apartments in Temecula that you can find today!